A sexually mature male will develop a hooked jaw, or "kype". This fish can be very territorial towards other trout, especially males of its own species. This aggression is sight-based, however, and can be somewhat controlled by breaking up the tank with rocks, plants, logs, etc. Brown trout are strictly carnivorous and will eat insects and crustaceans as well as fish, frogs, and other small vertebrates. They can be taught to eat pellets. This is accomplished most quickly with farmed fish, less quickly with stocked farmed fish, and less quickly still with wild fish. Feed 1-2% of body weight (ideally) 1x/day. A large gamefish that is difficult to keep in captivity, best left to private lakes/rivers and the wild. Juveniles spend 1 to 5 years in freshwater and 6 months to 5 years in saltwater. In freshwater they prefer cold and well oxygenated waters. This fish will exist in any area of a tank, most often taking food from the top and middle regions of the water column, but sometimes off the bottom as well. Brown trout can be a very active fish; the level of activity is usually determined by the conditions of the environment which it is placed. Under ideal conditions they may do a lot of swimming and cruise for food. With less ideal conditions they may "hold station" in one spot on the bottom or, if there is a current, hold station outside the current and wait for food to come by. Brown trout may also be seen swimming against the current. While this is perfectly fine and natural behaviour, be mindful. This behaviour can sometimes be an early indicator of a low dissolved oxygen level as these fish are seeking to maximize the flow of water over their gills to achieve a higher rate of counter-current exchange of oxygen to their blood. 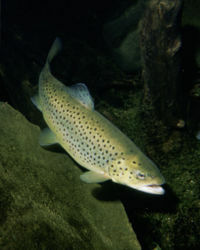 Brown Trout have a high degree of "sub-species" variation, but this trout is brown overall with primarily black spots and occasionally red spots. These spots often will have a white halo. A Brown Trout can be distinguished from an Atlantic Salmon (Salmo salar) in a few areas. Brown Trout will have circular spots whereas the salmon's will be angular and almost "X" shaped. Depending upon a Brown Trout's time at sea, a salmon should appear more silvery than the trout. Finally, a Brown Trout's caudal fin should be less "truncated" than a salmon's. A salmon has more muscle attachment here to allow for its more migratory lifestyle. In relation, the salmon's tail will appear slightly forked, opposed to the more squared edge of the Brown Trout's tail.